Sometimes we need to allow ideas time to grow. We don’t always have the right materials and knowledge when we first start out with an idea. It takes trial and error. This is a good lesson to impress upon our students. My wish to write a children’s book was a personal example of this. I thought you might be intrigued about the process I went through. Publishing a children’s book was one of those things on my bucket list. So 20 years ago I began to work on it. 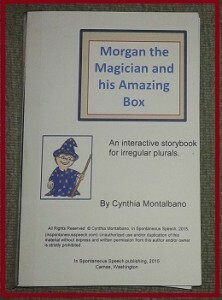 It had several different titles and variations but in the end I called it Morgan the Magician and his Amazing Box. I didn’t always have a lot of time to devote to it. I would get a part of it going, end up with a road block, and it would get stuck back in the filing cabinet until I was ready to attempt it again. 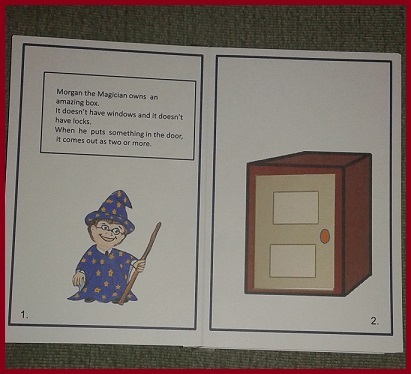 So how did I end up with the idea of Morgan the Magician you ask? Irregular plurals are not something that seem that important at first glance. Classroom instruction spends only a short time on them. They seem to play a small part of what students need for academic performance. However I find my language students usually have difficulty with them and don’t acquire them through the general education curriculum. I usually try to find some opportunity to review them. get them to memorize them. What else can you do when irregular plurals don’t follow the usual rules and are so irregular. This seemed to take more time out of therapy sessions than it was worth. Some would get memorized from the cards but were not used in any other context. So I tried to think of a better way. I decided putting them in a story would give them some context. My own children always liked the stories that had pull flaps and they could interact with. Rhyming also helps us to remember things. 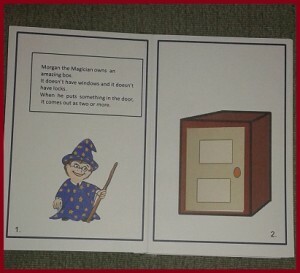 So this began my journey on making an interactive book with flaps that used rhyming. I often had rhymes swimming in my head so I had empathy for Dr. Seuss. I started by making it for personal use first. In the first version, I hand drew the characters and objects. This was before graphics were available on computers for the average person. My own children said my wizard looked freaky and would scare children. I decided I better make him a more friendly magician. My first version had a pull strip that was pulled through a door so that the single item went in the door and the plural came out the other side. It was a workable book but the strips were a bit cumbersome and students had a tendency to pull the strips all the way out. I also wanted the pages to be double-sided. The last challenge was making it printable and user friendly for construction. That turned out to be the biggest challenge. Getting a publisher interested would be another challenge, but then came Teachers Pay Teachers. I found I could just publish it myself. 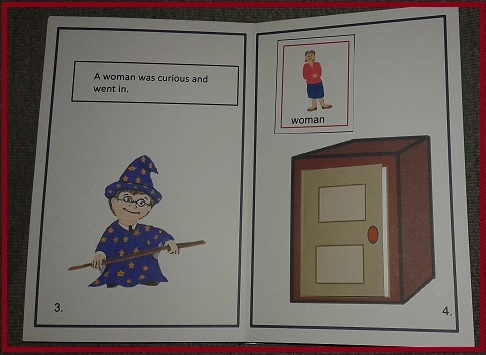 I discovered Power Point and that this program could be used for formating and placing clip art easily on pages. I got a notebook with a sketchbook app which openedup new possibilities for drawing characters. I could draw the magician once and then make some changes to him as I went without him changing appearance too much. No more hand drawing each page. It made it possible for me to make the clip art, make multiple pages, and make it in such a way that others could make copies for themselves. Then I had one of those light bulb moments. I could just use doors and have the pages back to back. 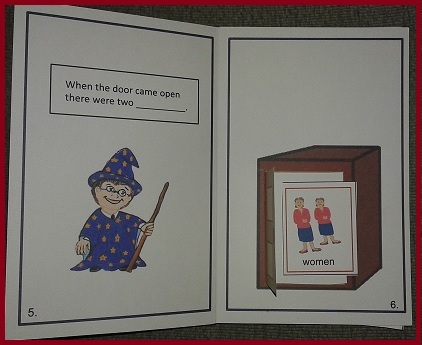 The single task card could be placed in the door by the student. The next page could contain the plural form of the word. 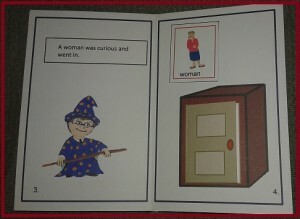 The task cards are separate so they can be attached with velcro and used for other activities. Such a simple method that took years for me to come up with. Click on the button at the top of this post for a direct link to TPT and the book.